While executives are interested in using mobile channels to boost brand awareness and increase engagement, companies aren’t dedicating more marketers to mobile or developing products intended for beyond their local market, a new survey shows. Open Mobile Media surveyed more than 700 senior mobile experts from different industry verticals in July, which it intends to discuss further at its Open Mobile Summit at the end of November, in San Francisco. While mobile marketing still seems like a nascent space, some of the statistics here tell a story that looks more akin to a mature space that’s flattening out. When asked where they saw the greatest long-term potential for their mobile products, executives mostly responded – 65 per cent – that they want to both retain existing users and attract new users. 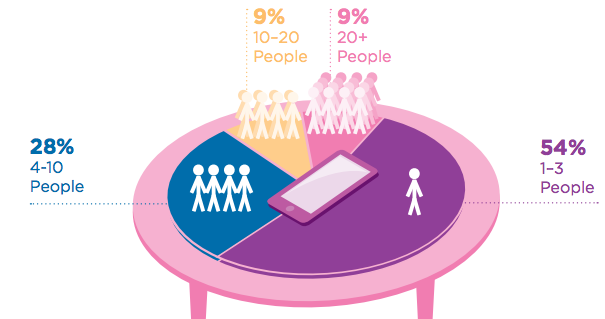 Even more, 85 per cent, have a focus on existing users, as the industry moves from prospecting the audience it wants to attain on mobile and moves towards retaining and engaging its audience. Mobile apps remained the most popular channel for exploring development over the next 18 months, but social networks and the mobile web also ranked very highly with executives. This shows that the “app craze” may have peaked and businesses are content with exploring other ways to reach their customers in the mobile channel. Perhaps most telling is that only 41 per cent of companies have a dedicated mobile marketing team, fewer than reported having one last year. Out of those businesses that do have a team, it’s probably a small one between one-three people. Last year, it was more likely that companies had more than three people working on mobile marketing.